A lot of art marketing advice tells artists to have a singular style or approach to their art because this can help build trust and maintain collectors. Yet, this advice can feel really limiting as an artist. Thankfully, there is another way to develop your unique artist voice. Hi my name is Carrie and here on Artist Strong I help people like you refine your skill and develop your unique artist voice. Today’s video is part three of a 5 part series all about finding voice as an artist. Today on Artist Strong I’m going to talk about the many benefits of working in a series. I know I don’t like feeling cornered or restricted as an artist: art is an act of freedom and sometimes even an act of rebellion. So, to be told to stick to one style riles me up. I know many artists drawn to many ideas and media. This is exactly why creating art in a series can be so valuable. Fact: our artist voice and style changes over time. The techniques we use, the ideas or subjects we wish to investigate, all of these things change as WE change. It’s one reason so many artists feel they don’t have a distinct style or voice. Series can help us not only build a body of art to exhibit or sell, they are a tool for finding and refining our artist voice. Part of skill development and growth is to feel stretched, to feel challenged. While trying new techniques and ideas and even different media can be a challenge, we can develop more consciously (and thus more quickly) if we use these new techniques repeatedly over a course of artworks. One artwork is one hypothesis. A group of artworks makes a series of hypotheses for a greater experiment. If finding your unique voice is important to you, a series offers structure to stretch, to be curious, and to grow. I’ve written about the benefits of batching your art before and it’s talked about in part one of this Guide to Developing Your Unique Artist Style. I also have an article called 6 Reasons to Create a Body of Art. It’s linked for you below this video as well. Working mindfully and efficiently on a group of artworks makes room for you to make more art! Series let us investigate a medium or idea and really dig into the topic. Creating in a series can help us decide which techniques and ideas we wish to keep in our work and which to let go. Additionally, there is a clear end goal: a certain number of works to complete. Creating a system that helps us feel a sense of accomplishment and achievement actively helps us work toward our larger art goals and stay motivated to keep reaching for them. Whether or not selling your work is part of your future, creating art in a series is a powerful way to build your skill and develop your unique artist voice. Do you want feedback on the art you are currently creating? a Facebook Live weekly Q and A on our Facebook Page Becoming Artist Strong. I’ll give you specific feedback on your art and answer your questions about developing your unique artist voice. 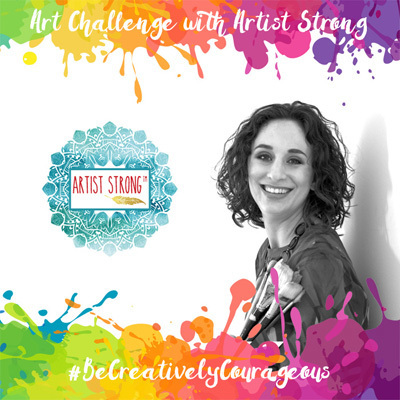 Now, it’s time to Be Creatively Courageous: Tell me about a series of 6-8 artworks you would like to create! Next month I’m hosting a series of free workshops on finding voice as well as sharing experiments that can help you find the right way to promote your art. If this sounds interesting be sure to sign up for the webinar below this video. Next week we will talk about how to use art critique (also called feedback) to improve your work. See you next week. Being told to stick to one thing riles me up too. It makes me go the other way. In addition to being an artist, I’m also a multi-passionate. Sticking to one thing over time feels so wrong and has a negative effect on my well-being. Back when I tried that approach, it was so misaligned that it hurt my business a lot more than helping it. At the end of the day, an Artist needs, in order to move ahead in the passion for improvement, practice, practice, and practice. Making Series on a subject definitely has advantages. By attempting to make a Series, requires concentrating on a subject to master in different varieties on a chosen subject, followed by different subjects to capture details. Let’s say, doing different Series on subjects like: Trees, Leaves, Buildings, Landscapes, Still objects, etc., that finally leads to almost command on the each subject. Eventually, achieving familiarity on different subjects, the Artist can achieve own creativity.